We are completely family owned and run. 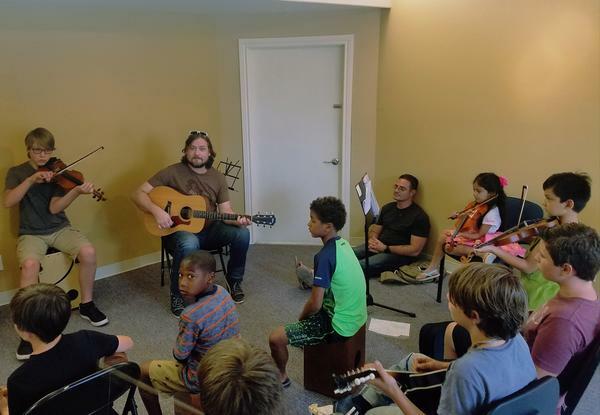 Our family enjoys teaching kids about music, and we are building both musicians and friendships. Our classes are fun and kids learn something new each week. 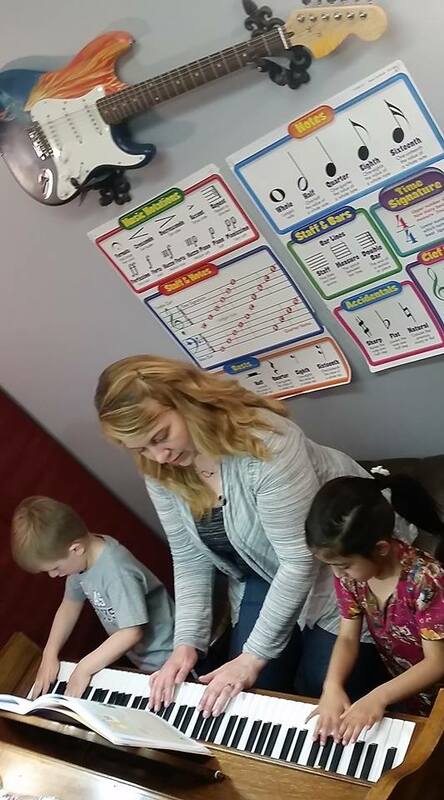 Many of our students can choose to learn multiple instruments at once in our classes. In addition, our weekly jam sessions and monthly concerts keep everyone practicing and motivated! We have been teaching full time for 10 years, and in Cedar Park for almost 3. We love the kids! The personalities, the excitement when they master a new chord or song, watching them help each other at the jam sessions. Music brings people together, and watching that community be built, having a hand in it, is so rewarding. My two daughters have been taking piano, guitar and ukulele lessons with Andrew, Jake and Deanna. Our experience with the studio has been very positive. All three of the instructors have been warm, encouraging, and fun. I love that they take a little time during each lesson to play something for the kids. In this way, my kids are able to experience music beyond their current abilities and also see what they will be able to do someday if they continue to learn and practice. The Wilson's love for music is apparent and contagious. My kids love their lessons and practice without being asked. We look forward to our time at the studio each week and have much appreciation for Andrew and Deanna's family. Thanks again for having us. Zack is great to work with. He is so patient and encouraging to all of us. We are so happy to have found you folks. We try to get students playing a song right away at their first class. Getting the excitement rolling right from the beginning is crucial to the student's enjoyment of music. Andrew and Deanna have been playing music for over 30 years each. We both grew up in family bands and have played professionally since our teens. We both have been teaching others to play, both formally and informally for 20 years or more, and have taught all 4 of our kids, who are multi-instrumentalists and singers. 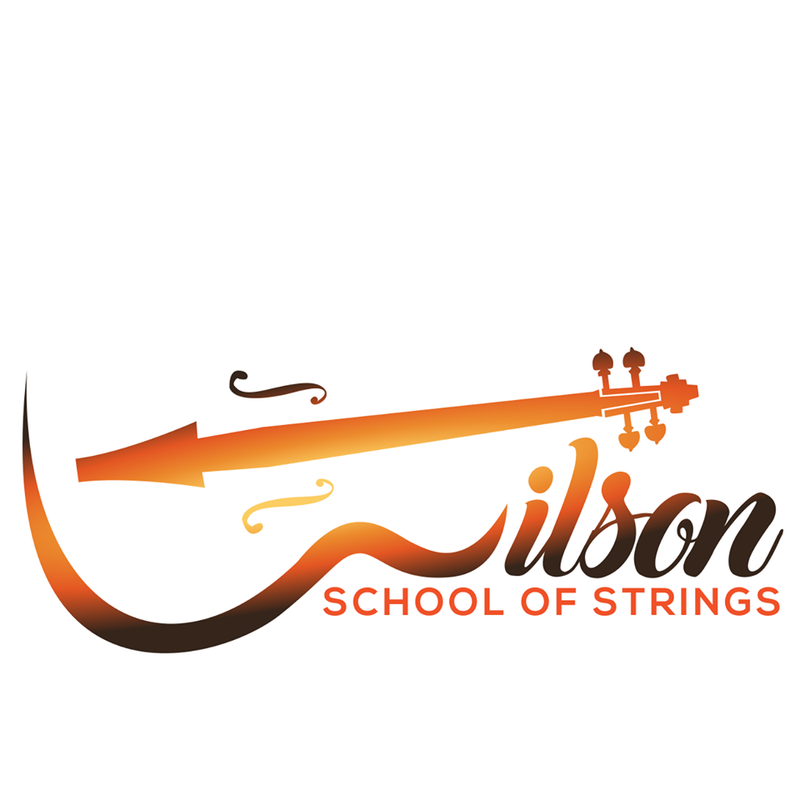 Our classes are $110/monthly, which includes your weekly 1 hour small group class, a weekly jam session, and participation in monthly concerts. We provide most of the curriculum, in addition. Our teaching started organically, helping our friends learn tunes when we were young teenagers, and learning from them. Over the years, as we had kids and continued to play music, we would get requests to teach others, and eventually it evolved into a family business for us! We teach all ages and abilities, from 4 years old to retirement age and beyond. We understand that each individual learns differently and so our classes are designed with that in mind. Each student progresses at their own pace, but can play with the group every week, to strengthen their chops and keep them excited and motivated. We are so proud of our students for their performances at our monthly concerts. In December, our Winter Gig features the majority of our students- this last year we had 120 students participating in 3 back to back concerts! This is true collaboration, with all ages and levels working together on arrangements, and the concert itself is entertaining and upbeat. Families love the diversity of our groups and we like to keep the show moving and surprising. It is so important to feel comfortable with your learning environment and your teacher. Good communication and a welcoming scene ensures that your child's first exposure to music is a positive one that they will take with them through their lives. How much time do you have in your life to spend with your instrument? Can a parent help a younger student establish a meaningful practice routine? Are you excited about the instrument you are learning? Practice is important, but it won't be hard if the student is motivated and wants to move forward. We like to call it "playing", to emphasize the fact that it is supposed to be fun.